Boston educator and vocalist Patrice Williamson’s new release, Comes Love, is one of many projects celebrating the 100th birthday of Ella Fitzgerald on April 25, 2017. The album, which pays tribute to the distinguished duo of Fitzgerald and Joe Pass, draws on 12 timeless standards that allow Williamson to craft “a narrative arc that reflects a woman’s journey from loneliness to love, and from lost love back to resilience and joy.” She’s accompanied by guitarist Jon Wheatley, her colleague at the Berklee College of Music and author of the book, Jazz Swing Guitar (Berklee Press, 2016). Fitzgerald and Pass made six albums together, and the songs selected by Williamson were all drawn from their recorded repertoire. Opening with Toots Thielemans’ “Bluesette,” Williamson and Wheatley provide a breezy, atmospheric reading, with Williamson overdubbing a flute solo in the chorus. Williamson’s light, supple voice is ideally suited for songs such as Ellington’s “Take Love Easy,” Billy Eckstine’s “I Want to Talk About You,” and Strayhorn’s “Lush Life,” where she easily negotiates the chromatics. The album concludes on a positive note, so to speak, with “One Note Samba.” The song offers a delightful change of pace and demonstrates Williamson’s scatting technique, while the interplay between her flute and Wheatley’s guitar adds just the right nuance to this bossa nova standard. 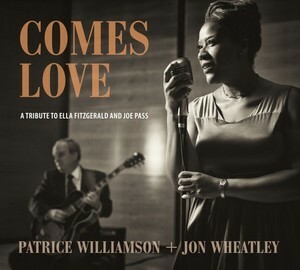 This entry was posted in Jazz and tagged 2017 music, 2017 releases, 2017 review, black music, Brenda Nelson-Strauss, Ella Fitzgerald tribute, Jazz, Patrice Williamson and Jon Wheatley - Comes Love: A Tribute to Ella Fitzgerald and Joe Pass, review by aaamc. Bookmark the permalink.